Lascaux cave is located in southwestern France and contains some of the most well preserved cave art in the world. 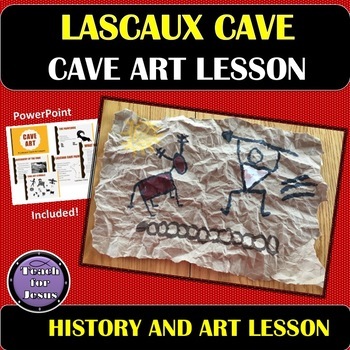 Students will have fun learning about this cave in a short powerpoint presentation and then creating their own cave art drawing. 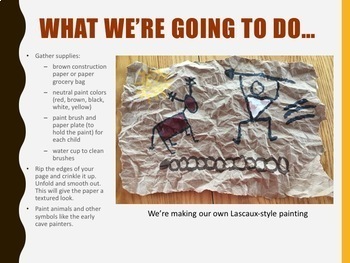 Using brown construction paper or grocery bags, students will create their own prehistoric drawing. First, they crumple the bag to give it texture. After laying the paper out flat again, they paint their own cave art using red, yellow, white, brown, and black paint. This is a simple, yet engaging, art lesson for kids, perfect for elementary aged students. For an extra twist, you could tape the paper underneath the desks and turn of the lights for a more "cave-like" experience. In 1940, WWII was raging and the Germans were taking Europe by storm. During this tumultuous time, 4 boys on the lookout for a lost dog found Lascaux Cave. At first they wanted to keep the cave a secret but too many people heard about it and knowledge of the cave spread like wildfire. It was believed that the paintings inside were very old yet the drawings on the wall were very well preserved and were not even faded. Because of the war, the cave was closed just months after it opened and it became a secret storehouse for munitions for the French Resistance. When the cave reopened, so many people visited the cave that the pictures quickly started to deteriorate. The caves were closed in for good in 1963 to preserve the paintings. In 1983, a replica of the caves was created. 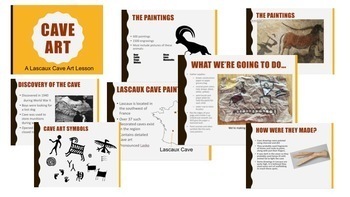 You can now only visit a replica of the art of the Lascaux Caves. I hope you enjoy this project as much as we did. Thanks for coming to my store!